This post may contain affiliate links or compensated reviews. Please read our disclosure for more info. We are getting asked more and more questions these days so it’s time I start addressing some of them! Some of the most common questions we get asked have to do with water. Is it safe to drink from your tank? Well, I hope this gives you a better idea of how we get water to our rig while living off grid. Where do we get water? Since we are primarily boondocking (camping without hookups or off the grid) we have to really search out where to get water. Luckily, we have great resources like Campendium that include reviews where people share places they filled up their water tanks or dumped their black/gray tanks. That is super helpful information for those of us who enjoy spending time in nature and not in RV parks. When we find a place we want to visit, our next step is to search out water. 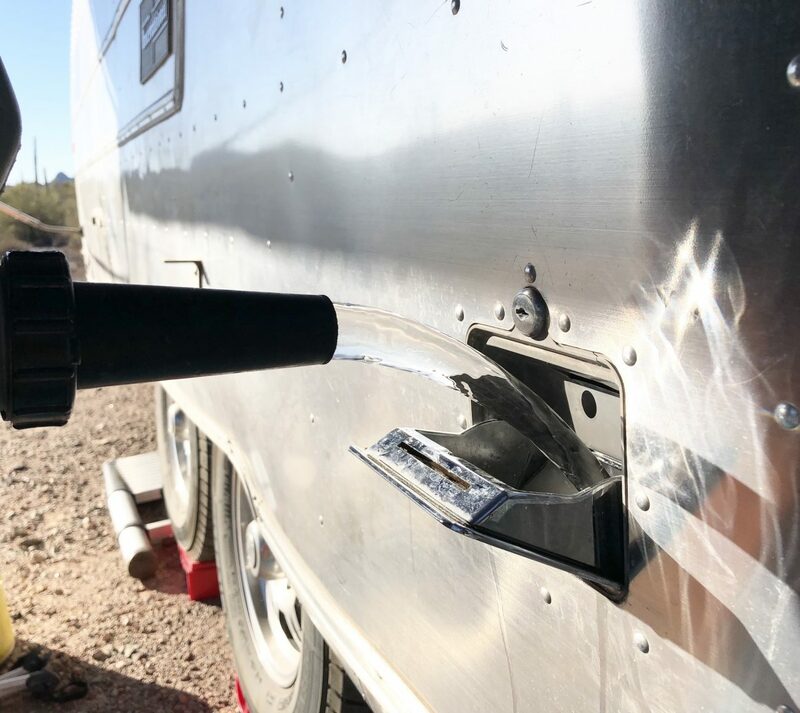 If it wasn’t mentioned in a review or if we’re somewhere not many people know about, we try calling a few gas stations to see if they have potable water or nearby RV parks to see if we can fill up there. Most RV Parks will let you fill up your tanks for a fee. Typically for our 40 gallons, we are charged anywhere between $3-$10. First, it is very important that you invest in a good hose. You want one that is plenty long because there will be situations where you will not be super close to the water source. We didn't want one of those bulky hard hoses because they take up a lot of room and are a pain to coil up. We use a zero-G flexible hose because it's 50' long, but collapses down to a fraction of it's size. The connectors are high quality and the the outer weave keeps it from getting snagged on things. We love it! How do you get water in your rig? We don't haul with our tanks full. Some folks do that (and that's totally fine), but our rig is 46 years old and with all that extra weight going down (usually) super crazy roads, it’s just not a risk we want to take. So we bring in the water after we get to our spot. We also have two 5.5 gallon Rhino water jugs that we fill up at the same time as the water bladder getting us just over 40 gallons to fill our fresh tank. Having an on/off switch and adding a bit of length with a flexible hose protector makes it easy for one person to switch between filling the bladder and Rhino Jugs without making a mess. It saves a bunch of time not having to turn the water off and on at the source, too. Sometimes if we’re getting low on water, we’ll just go fill these up at one of the water stations nearby where we usually pay $1 (sometimes $1.25) to fill up with 5 gallons. Then we just top it off. Once we have our 40 gallons of water, there are a couple of ways to get it in the fresh tank. The first option is to back the truck up near the water inlet and just run a short hose from the water bladder to the inlet and let gravity do it’s thing. Sometimes the lay of the land doesn’t allow for that so we’ll just empty the Rhino jugs into the tank and refill those by putting the bladder on the edge of the tailgate and refill the Rhino jugs one at a time. Yes, it takes awhile, but it’s really not a big deal. Having this on/off switch on a short flexible hose protector really helps with this process, too. There are several small water pumps that you can invest in to transfer the water quicker. Jonathan just ordered this Milescraft Drill Pump so we'll let you know how that works out once we get it and put it to use! The water bladder is the real game changer here. I’m not sure how anyone boondocks for long periods of time without one. We have no place to store more than 2 of the Rhino jugs so the bladder has been one of our best purchases for living off grid! Do you filter your water? If we are parked at a campground, we will typically use one of our blue water filters, but honestly, I’m not sure they do that much. They do slow the water pressure down which in some cases is super helpful. If you don’t have a water pressure regulator, you really need one. Some campgrounds have crazy water pressure that can really damage your rig. We ALWAYS filter our drinking water. ALWAYS! We use a Big Berkey Water Filter that we have had for years and we will never be without one! It literally removes 99.9999999% of pathogenic bacteria and 99.999% of viruses. Say whaaaat?? You can read more about all the crazy things it filters out of your water here. If you don’t have $300 to drop on a Berkey I’d suggest you invest in some kind of filter you’re comfortable with but please, please don’t buy cases of water bottles! There is really no excuse for that! It’s such a waste of plastic and you know it’s bad for the environment. Filter you water and get reusable water bottles. There are so many good options now. We use Hydro Flask water bottles to keep our water ice cold all day and they are our favorite! I love that they come in so many great colors. The kids pick their favorite color and no more arguing over who’s bottle is who’s? Plus, I think they drink more water when they have their OWN special cup! I’m strongly considering getting rid of all our other cups that we rarely ever use. How long can we last on our 40 gallons of fresh water? Well, that’s a complicated question. There are many factors that go into it. Do we have complicated meals planned that use more dishes than our typical meals? Or will be be eating out more than usual? If we are very careful with our dish washing and if we don’t require too many showers for the week, than we can typically make our 40 gallons last us a whole week. Keep in mind, we are a family of 6! Long gone are the days of standing in the shower in a home using a whole water tank of hot water. If we are really trying to conserve our water, we love to use these Epic Wipes in-between 'real' showers. They smell great, easy on our skin, and saves us a bunch of water. What I love most about them is their size. THEY'RE HUGE! We actually use one cut into four pieces for the kids to wipe down. Jonathan and I also cut one in half for us to share. We all get clean with just 2 Epic Wipes! They have been super great to have in times where we need to clean up but don't want to use our water for showers. When working on our renovation, we made sure to invested in a really great water saving shower head. We went with the Ecocamel Jetstream and it has really helped us cut down our shower time. It uses Aircore Technology to inject air directly into the water stream so we use less water but still get great pressure! Love that thing! You can also add Aerators to your bathroom and kitchen sinks, too. If you have kids that sometimes forget about saving water, this can really help! We go to a state park around once a month so we can all get really good showers and not worry too much about the amount of water needed to wash our hair (#dreadlife). It’s always a happy day when we are all showered and smelling fresh. Add in freshly washed sheets and we're living the dream! We have been in a situation where we got showers at a travel stop, but those can be pretty expensive for a family of 6. Typically around $12 per person but sometimes they reluctantly let us all take turns in there before they go to clean them. It’s not our top choice, but sometimes it’s necessary. Do you sanitize your tanks? Absolutely! We try to do this at least twice a year. Some people use bleach, but we are not those people! What we do is get a gallon of white vinegar and we dump the whole thing into a half full fresh tank. Then we will drive to our next destination which needs to be a place with full hookups (bonus points if it's a bumpy road and a long drive) so that the water and vinegar and jostle around and clean the inside of the tank. Once we arrive to the park and get set up, we will run the vinegar water through all our lines in the RV. We'll run the shower some, and the bathroom sink and the kitchen faucet. We'll do that until our fresh tank is empty. Then, we'll fill up the fresh tank again with fresh water and use that up by taking showers, washing dishes, cleaning the floors, cleaning the fantastic fan vents, and anything else that needs a good scrub! Then we know our water lines are clean as well as our fresh tank. While we are still at the RV park with full hookups, we take that time to also sanitize our Rhino jugs and our 30 gallon water bladder, too. Hopefully this helps you understand our water situation a bit better. If I’ve left anything out or if you have other questions, please comment below so I can do my best to answer them! Love the idea of boondocking or camping off-grid, but have no idea where to start? Signup and we'll send you 4 quick ways to scout beautiful, safe, off-grid camping locations. Ashley Longnecker is the fiercely independent tattooed and dreaded half of Tiny Shiny Home. She's a woodworker, photographer and maker of delicious baked goods. She loathes schedules and makes every day an adventure. Want to keep up with the Longneckers? We'll send you a newsletter of all the things we've posted online throughout the week. Just enter your info and hit subscribe! Enjoy time with your kids - they're awesome! Want to work with Tiny Shiny Home to get the word out about your product or service? Have a question about full-time travel or Airstream renovations? Just want to say hi?